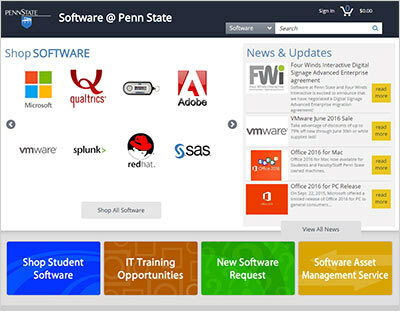 Penn College students can order software from Penn State's Software Store. Students are eligible for a Penn State Software Store account for as long as they remain a student. When that association ends, the Software Store account will be disabled. Questions about eligibility should be directed to the Penn College Student Help Desk. Shop online today at Penn State's Software Store. Be sure to have your student number handy, as you will need it to check out and finalize your purchase. Additional details about this service can be found on the Information Technology Services department site on myPCT.